A tall man with silver hair and brown skin enters my consulting room, hunched forward a little. His voice is husky in the familiar way of his people, his speech deliberate. The face is a compound of care and charm. He is not young but he is well muscled and broad. He bends his torso somewhat, and inclines his head a little as he speaks, his mouth almost smiling – in propitiation? Has a lifetime among white people taught him to smile as he speaks, even when – as now – his speech is full of sorrow and care? I nod again, admiring again his lean, muscled body. I look up and scan his face, looking for something that seems to be missing: where is the irony, where is the anger? He seems to have none. “Last year my wife got sick. She was in the hospital, but in the end they say to me – ‘you take her’. So I take her home. She was in the wheel chair, she liked to be outside, so I would take her out there, she’d sit in the chair with a mask on her face – for oxygen. The boy would come out to her and sit with her, and he would cry. I see them and I cannot bear it. A boy needs his mother. The boy cried when I sent him back. He wanted to stop with me. “I fly my car. I don’t mind the drive, it is good country, beautiful, all the way. Heavily, I tell him that the doctor who decided he must not drive trucks is probably right. The Law says a doctor can’t let you drive trucks if you have a history of heart troubles. But I tell him I will obtain the reports from the Adelaide doctors and forward them to an independent heart doctor and see whether he can have another chance. I try not to raise his hopes. The old man rises, takes my hand. The smile is full now, his hand large, dry, warm. He thanks me and goes away. Sadder, wiser, I watch him go. This is an excerpt from Raft by Howard Goldenberg. Hybrid Publishers, 2009. For forty years I have worked as a GP. 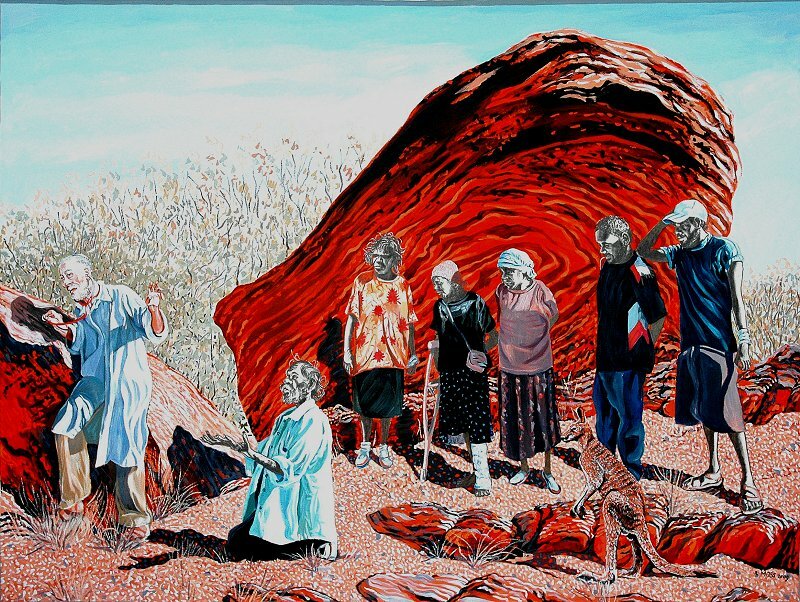 I have seen and shared in all the dramas of the lives of my patients, both in outer suburban practice and in scores of remote Aboriginal communities. I thought I had passed beyond shock and reached a calmer shore. 1990. My maiden posting in an indigenous community. In the Emergency Department, the first patient is brought in with a burned leg. He lies, apparently insensible of pain. So drunk last night that he fell into the fire, so drunk he couldn’t roll out of it, so intoxicated – the word means poisoned – he slept on in the hot ashes. We remove his trousers and the charred meat that was his leg falls away in chunks. Next patient: belted over the head with a nulla nulla while drunk – at 10.00am – he won’t wake up. Is he simply pissed, literally out of his mind, or is his brain bleeding? Next patient is 30 years old. His heart muscle is flaccid, failing. He has alcoholic cardiomyopathy. He’ll die without a transplant. In the comfortable mainstream such stories feed the mills of lazy generalization and undeclared prejudice. In the mainstream, we ‘know’ blackfellas can’t drink responsibly. Not like us whitefellas. Let the self-congratulating mainstreamer join me on the Oaks Day train from Flemington back to the City; let us witness together in our crammed carriage, young women falling out of their gorgeous dresses, toppling from their high high heels, shouting to each other, in alcohol disinhibition, intimate details of their love lives, staggering, collapsing into the laps of seated passengers, whinnying with helpless laughter; and note that these people, not underprivileged, not indigenous, belong to our culture where going out equals partying equals drinking equals drunkenness. Let the disdainful mainstreamer swallow this: the proportion of blackfellers who drink is far lower than that of whitefellers. There is nothing new in any of the above. We are a nation with a drinking problem. Alcohol is a colourless liquid. Its harms are scarlet and black. 1968. I am a medical student in residence at the psychiatric hospital. Here a patient, intellectually impaired, is eight months pregnant. She has been an inpatient for twelve months. No family visits her. The baby has been fathered in hospital. 1972. I start to work in the outer suburban practice where I will become a partner for nearly thirty years. Every Thursday I visit the local home for intellectually impaired boys. Mental illness is embarrassing, almost shameful, so we have hidden these children away in an institution, where the Brothers care for them. I cannot gain my footing at the home: the Brothers are neither priests nor nurses; they do not provide satisfactory answers to my clinical questions. I cannot satisfy myself that the residents are well cared for. But I am new to the practice, new to medicine. Perhaps that is it. 2001. I leave the practice after 29 years, no wiser. The Brothers don’t seem holy or caring or competent; nor helpful with information. Again I doubt myself. It takes a long time for my generation to comprehend the reality of endemic abuse. For too long we lack the questions. Barcelona in the sunshine. Annette and I stroll down the Ramblas, admiring everything. The weather is benign, the street theatre brilliant, the shops alluring, the cafes innumerable. Everything is old and quaint or new and gaudy. Or Gaudi. The Rambla is famous among tourists for all of the things I´ve mentioned, all the things that seize our attention, and while our attention is seized, our wallets, handbags and purses are also seized, by pickpockets and by bobby dazzlers. The bobby dazzler operates by doing something unexpected or outrageous that grabs your attention at just the moment that his accomplice jostles you and relieves you of your wallet and runs. The Rambla has played host to many, many shoppers, but none the equal of Annette. Annette has a plan with which she will foil the pickpockets: she´ll spend all her money before they can catch up with her. And so it is that Annette hits the Rambla running. Single-handedly she rescues the Spanish economy. Her targets are shoe shops, jewellers, children´s outfitters, leather clothiers, and dress shops and dress shops and dress shops. I am dizzy with admiration. Spain is in surplus. Only the pickpockets have a bad day. I take my vertigo to the Zurich Café, where I will drink coffee in the sun and read my book, until Annette, the Goddess of Commerce, exhausts her resources. After three days on Christmas Island I take night call. The phone rings at 0045. It’s Henry the Team Leader, Henry the unflappable, Henry who smiles at every reverse, at all bad news. The drive along half known, unmade, unlit roads takes longer than it should, as I make a number of wrong turns. There is a moon, bright against the island’s dark sky. A black cloud bisects the moon transversely, sitting across its upper half. The black is very black, the white brilliantly silvery. I have never seen a southern hemisphere of moon like this. When I arrive in the clinic, all cubicles are full. There are the five men who have cut themselves, and not one, but two, who’ve tried to hang. I don’t know where to look first. I don’t want to look at all. In the nearest cubicle a man lies flat on his back, his throat livid in the glare of the examination light. He does not move. I speak, asking his name. Something is wrong, something is upside down. The hunger striker and I stare at each other from opposite sides of a scaffold that neither of us constructed. I follow the protocols, which are wise and worthy. But it is all wrong, everything is upside down. My job is to work to improve or protect health. I have to find a way, to create a language that the patient and I will share; to locate and level the place where we will meet. This contract is not spelled out nor ever inked; elsewhere there is no need. The patient is here, I am here, we can get down to work. But when I attend the hunger striker all of this is inverted and twisted out of shape. The person whom I attend is not a patient: the person gives no sign, has no wish for my attention. The non-patient never called me; I am a part of the system that he imposed upon first; now the system imposes me upon him. The non-patient and I have opposite wishes: mine is to protect life and vital organs, his to destroy them. The generality of patients whom I see here in the Detention Centre come to see me on my own territory; I mean the clinic. But the starver is weakened, usually lying in his room in the Compound which is located behind high, stout electrified fencing. The nurse and I walk along long corridors without natural light. Serial serious doors unlock to admit us and lock again behind us. We emerge into sunlight in an expansive open area, surrounded by discrete bedrooms for two persons. My teacher in the Second Class is Miss Paul. She is tall and slim. She has very fair hair, which she bundles high on her head. Her bosoms are not large, but in her case this does not matter. Miss Paul speaks in an unusual manner, rather like the news reader of the Australian Broadcasting Commission. It is a very precise sort of diction. Although her speech is different from ours, I can understand whatever Miss Paul says quite easily. Miss Paul is beautiful. And precise. And exacting. I look up to her and I want to please her. She requires her pupils to sit up straight. I sit very straight. I follow her with my eyes and I do as she says to do. That means the king has died and someone else will wear his crown and sit on his throne and be our ruler. The king had no sons, so the new monarch will be our queen. Now the princess with parted knees will become the queen. Miss Paul arranges for us to view facsimiles of the Crown Jewels. I cannot believe that these robes, the crown, the orb and the sceptre are not real. Miss Paul teaches us everything we should know about the coronation. It is very splendid. We children of Second Class at Leeton Public School are intimate with royalty because Miss Paul is herself from England. She is England, with all the authenticity and superiority that England means. Miss Paul lives in the elegant Hydro Hotel, the highest building in the town. Her suite is on the second storey, looking out at the water tower that gives the hotel its name. It is a long and arduous task to walk up the hill to the Hydro. One Saturday morning, Dennis decides that we should pay a call on Miss Paul. His initiative is audacious beyond imagining. What if she’s not home? What if she is at home? What if they won’t let us in? What I really mean is, What right have we commoners to pay a visit to royalty? Dennis is certain it will be alright. All the way up the Hydro hill, I lag behind. I voice my doubts, I threaten to turn back, I tell Dennis this is wrong. Dennis plows on. My fears cannot touch him. This idea of his is too frightening for my tiny courage, but I cannot resist it. This is the land of Danger, where Dennis always ventures, where I cannot help but follow.